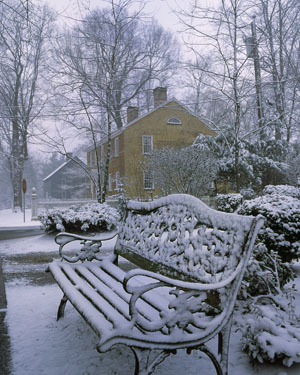 Snow-dusted bench ... Best friend of the photographer is the U-turn, and I immediately took one after my peripheral vision gave up this snow-dusted bench as I drove down Main Street in Glastonbury. I liked the way the yellow brick tones of the house made a soft background as I closed in on my composition. I tried several times to shoot this scene in other seasons, but it’s nothing without the powdery snow.